Where? Labor? Table Tops? Mirrors? Restoration Glass? Insulated Units? Old Glass? Wood Sash? Screens? Picture Glass? Aluminum Sash? Q: Where is U.C. Glass located? just east of Shattuck Ave.
A: Our shop hours for cutting orders and pick-up of products is M-F, 8-9, or by appointment, service calls M-F, 9-5. Q: Do you cut glass/mirror to my sizes? A: Yes, measure twice and allow for some clearance, about 1/16 ". 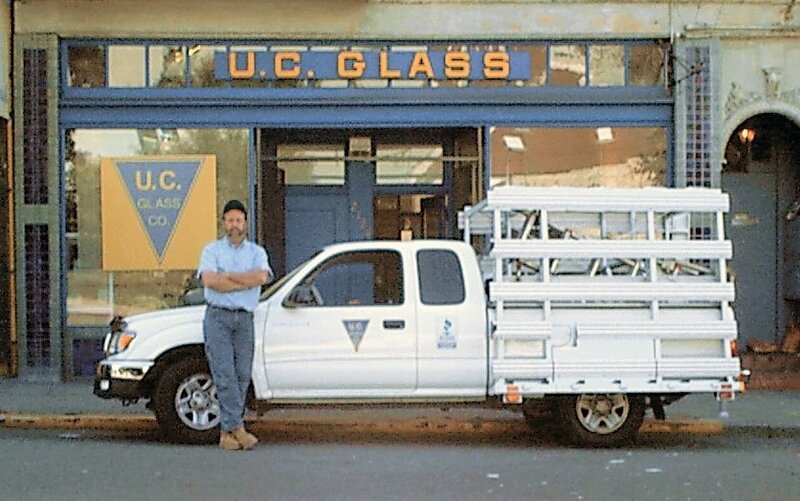 Q: Do you do auto glass? A: Sorry, we don't do auto glass. Q: Do you install glass? Q: What is your labor rate? A: $135.00 minimum. Labor is figured by difficulty, size of window, and location, such as 1st, 2nd, 3rd floor. A: Measure the glass you can see, sight line to sight line, then type of frame, wood/metal etc. Floor from outside and city. Q: Can you re-putty old frames? A: Yes,we remove loose and old putty, clean and re-glaze with new Dap #33 for wood or #1012 for steel, we specialize in professional glazing. Q: Do you make new wood sash? Q: Can I order aluminum sash windows from U.C. Glass? A: Yes, we deal with several manufacturers of sash. Q: Do you supply insulated units? A: Yes, they come in a wide range of glass and thickness. Q: Do you have do-it-yourself supplies? A: Yes, Putty, points, some tools, glass cutters, or glass cut to your custom size, we also sell and ship a pro tool kit that has what you need to do it right. Q: Does U.C. Glass sell mirrors? A: Yes, several thickness, all good quality, with a wide range of edges. Q: Can a table top/shelf be made to my sizes? A: Cash, Visa/MasterCard, check, or a 30 day account after a basic credit check. Q: Do I have to be home for an installation of a window? A: Sometimes no, but we like someone to be there to give us access to clean up and for payment, after job is complete. Q: Do you make screens? A: Yes, custom to your size or we can fit and install them. Q: Can I fax my order? Q: Do you sell picture glass? A: Yes, cut to any size. Q: How far in advance do I need to call for a service call? A: It varies, we have some same day apt's, they go fast, to be safe you should plan on one week in advance, but we do what we can to fit your schedule. Q: What are the limitations on the size of window can fix? A: I do all the outside work myself, I can handle almost all window installations. The only time I can't is when the window or mirror is to large to handle safely. Call for information. Q: Can I bring a window sash in to your shop for the glass to be fixed? Q: How long does it take to get tempered glass, and can it be cut? A: Tempered glass can take as little as 3-4 working days, or if beveled or insulated as long as two weeks. Q: Can you cut my old glass? A: Yes, Depending on size and cuts, the normal rate would be $5.00 to $10.00 per pc. Edge type is a big factor of the price. Q: Do you sell plastic? A: No, TAP Plastic in El Cerrito is the closest. Q: Do you re-silver mirrors? A: No, it costs four times what a new one does and makes scratches more visible, also causes toxic waste. A: We salvage old type glass with the ripple - supply is limited. A: We can order new hand blown glass for that old window pane look. Q: Do you have a contractor's license? A: Yes, # 613150 in good standing and current, we are also bonded and fully insured.